OLPC of course led this charge with their bold attempt (and respectable finish) at making their hardware 100% open source (mostly) and designed to be fixed in the field. 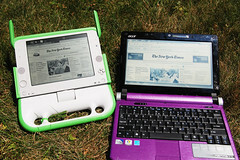 While I don't totally buy the untrained elementary school children repairing computers, I have seen some frighteningly capable teens tear down OLPC XOs and rebuild them. I love the approach Pixel Qi is taking by making their screens intentionally hackable into other systems, and hope that more components will move this way -- quickly.